The recently arrived Light Cruiser Cassandra is mined off the Gulf of Finland and sinks with 11 dead. 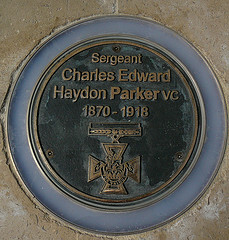 Battery Sergeant Major Charles Edward Haydon Parker VC (Royal Field Artillery) dies in London at age 49. On 31st March 1900 at Sanna’s Post, South Africa ‘Q’ and ‘U’ Batteries of the Royal Horse Artillery are ambushed with loss of most of the baggage column and five guns of the leading battery. When the alarm is given, ‘Q’ Battery went into action 1,150 yards from the post until the order to retire was received, when Major Phipps-Hornby, commander of ‘Q’ Battery, ordered the guns and their limbers to be run back by hand to a safe place. For his actions Sergeant Parker was awarded the Victoria Cross. Major Philip Edmund Vaughan DSO (Worcestershire Regiment) dies on service at home at age 40. His brother was killed in April 1915. Lieutenant Hubert Burgoyne Davey (South Wales Borderers) dies on service at age 28. His brother was killed last October. Chaplain the Reverend Frederick William Ainley dies on active service.